Due to the strenuous lifestyles we lead today, it’s incredibly easy to fall prey to pimples. 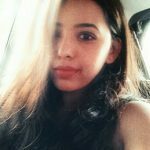 Each one of us may have more than one trigger – be it fluctuating hormones, stress, eating sugary foods, not getting enough zzz’s or simply following an unhealthy diet. 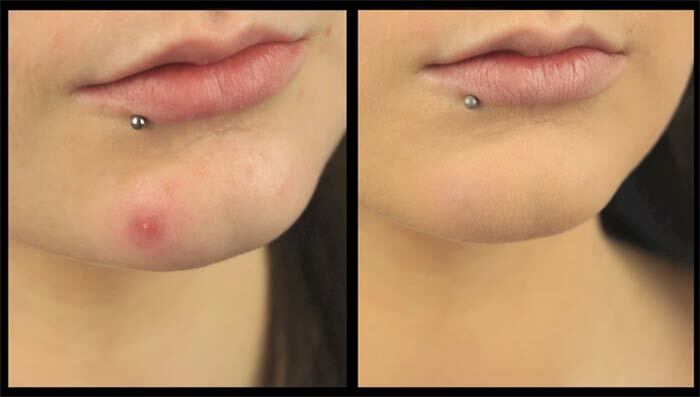 No matter what your cause is, these pesky pimples may appear at crucial times – like right before a big event! Ultimate disaster scenario, right? Well, here’s when your makeup comes in handy (however, you’ll need a dermatologist and more if you’re looking for a permanent solution.) Want to know how? Read on to find out how to hide pimples with makeup. 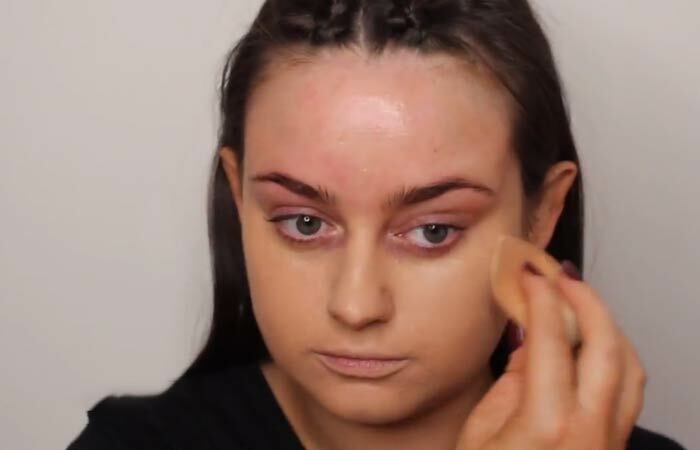 A little bit of color correcting concealer, a dab of foundation, and some setting powder can work wonders to temporarily hide that pimple you’re fretting over. 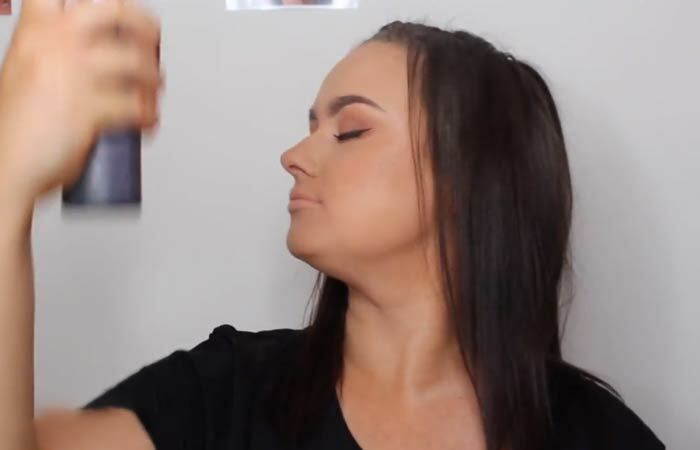 Let’s take a look at how to make the best of your makeup to do so. 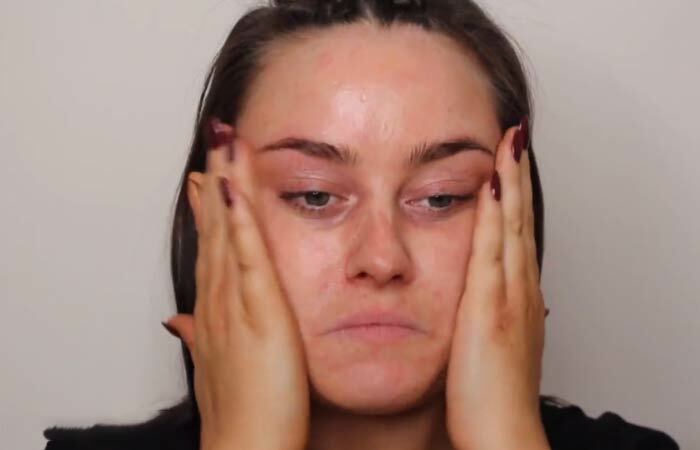 Before we begin, let me tell you, the trick is to simply combine spot-treatment with a thin layer of foundation so your face does not end up looking cakey. The best thing you can do for your skin is to keep it minimal. Always pick the right primer for your skin type. It’s advisable to use a lightweight, oil-free primer to keep your makeup in place, especially concealer, on an inflamed spot. Also, it’s even better if you find one with SPF in it, especially if you deal with hyperpigmentation or scarring. Sun exposure slows down your healing process. Find a concealer that matches your skin tone. Also, color correcting works beautifully for angry, red zits. A soft concealer brush is important for precise application and blending out the formula. If you’re acne-prone, it’s best to use a non-comedogenic foundation that isn’t full of too many chemicals. Also, it does not interfere with acne medication. Use a mineral powder to keep your acne-prone skin happy and healthy. They provide less coverage, but they are less likely to clog your pores and cause further breakouts. 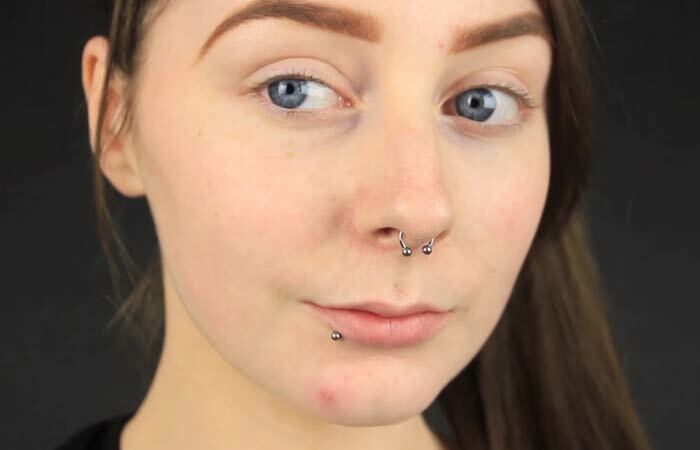 Here’s a simple technique to hide pimples or red bumps. 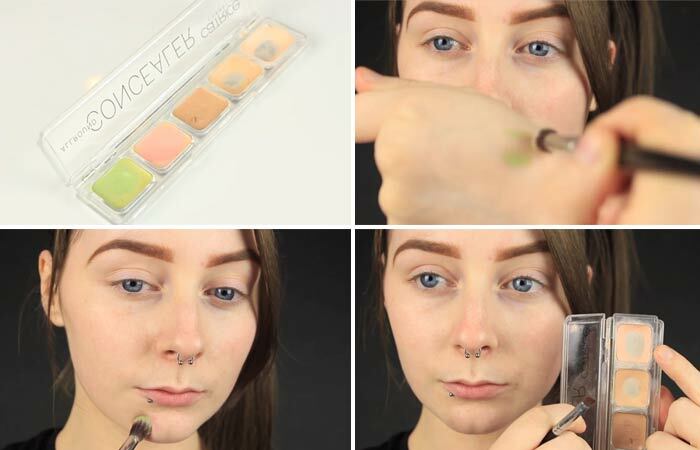 This is perhaps the most essential step to help you achieve desirable coverage and also for your makeup to look flawless. Cleanse your face well, add a toner to your routine, and moisturize using a gentle, oil-free moisturizing lotion or one that suits your skin type. Apply your primer to add a barrier between the makeup and your skin. If you don’t want to use the primer all over your face, you can use a brush and apply it only to spots and problem areas. It all depends on what works for you! A green concealer works best to diffuse any signs of pigmentation and redness. 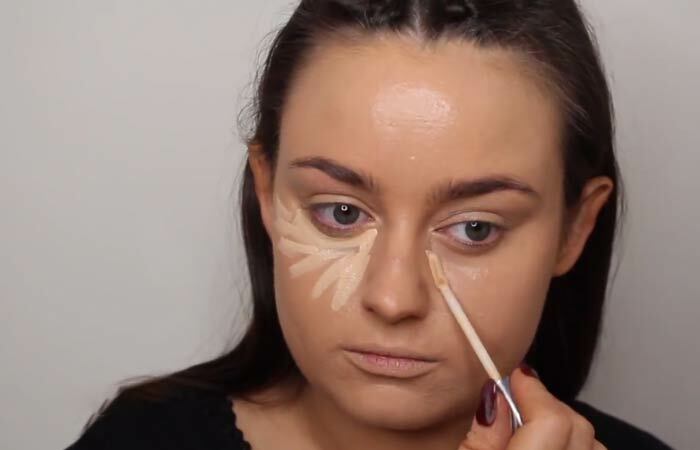 Blend it out with a brush and then apply a concealer that perfectly matches your skin tone. This helps in completely blurring out the spot. This step is optional and if you aren’t happy using a foundation, you can either use a BB cream or skip it, as per your preference. 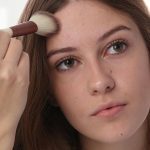 In case you are going for a foundation, take very little product and blend it out using a stippling brush or a blending sponge. Use a compact or a setting powder to set your concealer in place and to prevent your face from looking shiny. Pro Tip: You can also use a finishing spray to seal your look! This won’t just help your makeup last, but will also break up any cakey-ness caused by the heaviness of your makeup. What I like to do when I have a pimple or two is to use the simple art of distraction. This involves shifting the focus from my pimple to perhaps my eyes by using a bit of mascara and eyeliner. If I have pimples on my forehead, I simply add some gloss to my lips to shift the attention to what makes me feel good. I see a lot of women getting really upset when their skin seems to be having a bad day, but really, it’s not the end of the world. It’s a problem that can be fixed and treated, and meanwhile, a little bit of concealer has you covered. Besides, if your acne seems to be severe, it’s best to make an appointment with the dermatologist because they will know exactly what your skin needs. There you go! You successfully concealed that pimple you were worrying over. Moving on from acne, if you are facing the problem of facial eczema, you must know that it’s not just a matter of treating the symptoms with medication but also of hiding the redness so that it does not draw too much attention. 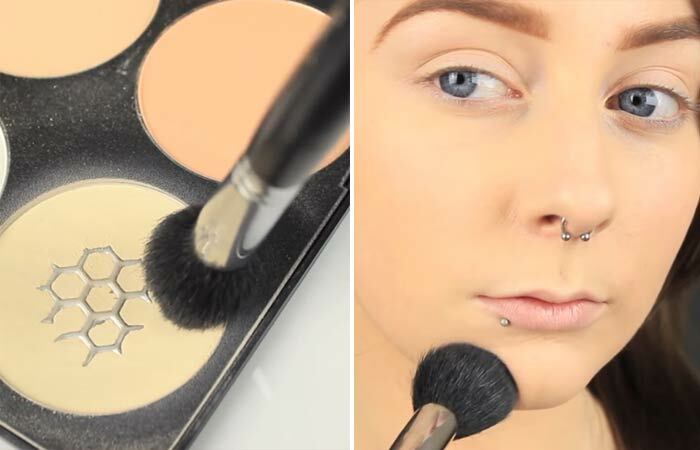 Here are a few simple methods to help you cover up the problem using a bit of makeup. Please note that using makeup on a regular basis can only worsen the problem. Eczema, also known as ‘Atopic Dermatitis’ is a common skin condition that a lot of women face, so you are not alone. 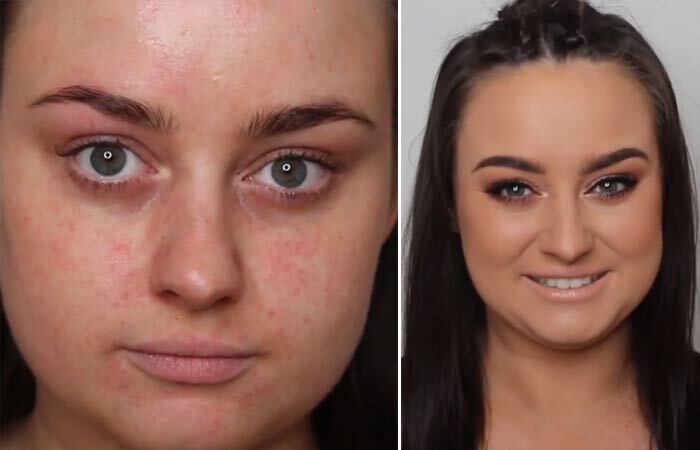 I must say that makeup is not the final solution, but while you’re treating it, you can use makeup to cover up problem areas to the maximum extent. Use a hydrating primer to take down a bit of the redness. Use a high coverage waterproof foundation that is not too drying for your skin. 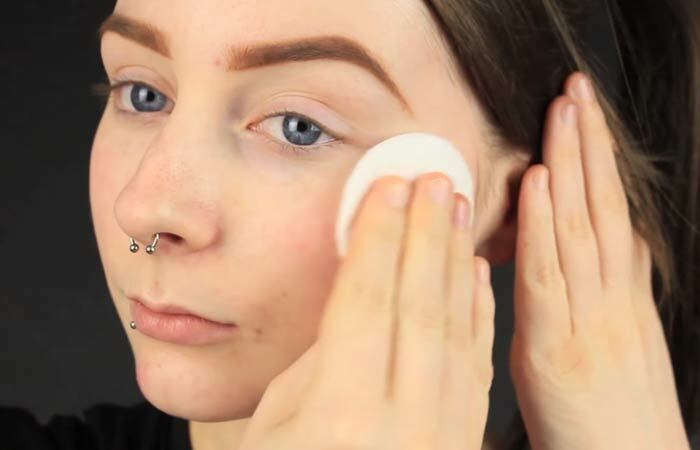 Use the egg-shaped blending sponge or a Beauty Blender. Make sure it’s damp before you go in with the product for best results. 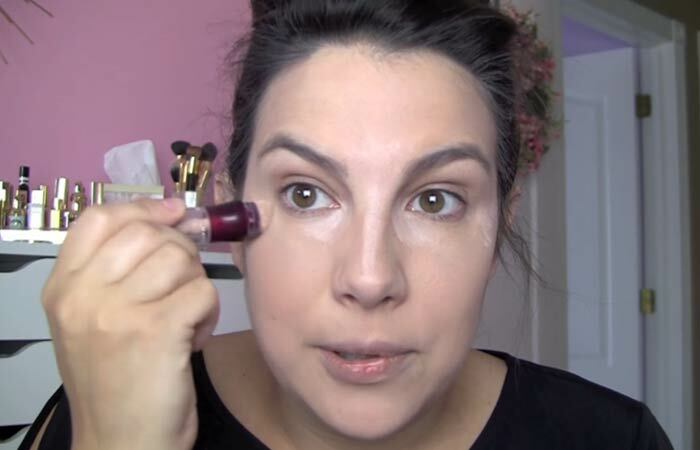 Add a concealer that’s either creamy or liquidy. It’s essential to pick one that’s pigmented, yet it shouldn’t be caking up your face. A hydrating powder is what you need to set your makeup and avoid that dreaded chalky finish. To warm up the skin, you can add a bronzer and blush to your routine. Avoid ones with shimmer or any form of glitter. Use a hydrating mist to set your makeup in place and extend its staying power. In these simple steps, you can cover up your eczema. Take a look! The key to perfect makeup application lies in a smooth base. With eczema, it’s often difficult to attain a completely smooth base, but it’s crucial to cleanse, exfoliate, and moisturize your skin with a hydrating lotion before you go in with any other product. Apply your hydrating primer all over your face with your fingers. Spray some hydrating mist on your beauty sponge to make it damp and take a little bit of liquid foundation on the sponge and blend it out properly all over your face. If you’re going for a more intense coverage for a party or an event, it’s advisable to use a high coverage liquid foundation to conceal all redness. Use a liquid concealer that is very pigmented yet lightweight in a shade that’s one or two shades lighter than your skin tone for the areas that you want to conceal and highlight. To conceal spots, use a shade that matches your skin tone. 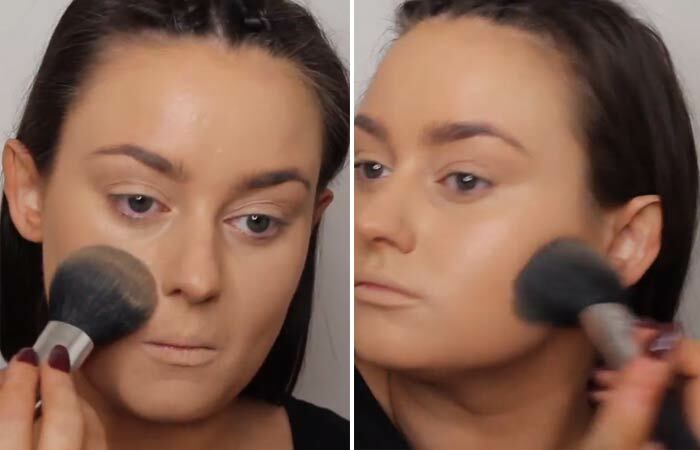 Blend the product out using your damp sponge. 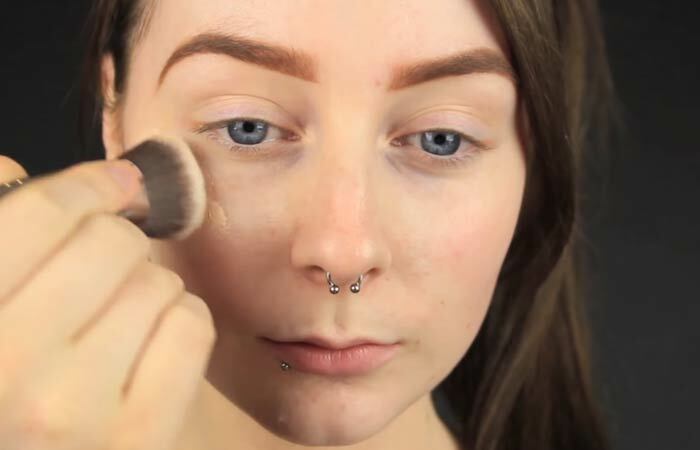 Using a powder brush, gently pat your setting powder all over your face to set your concealer and foundation. For some warmth, add a bit of bronzer with a brush. Use a creamy blush on the apples of your cheeks to add a bit of color to your face. However, if you’re facing a lot of redness, then just the bronzer should suffice as it helps create a natural glow while balancing out any red patches. Set your makeup with a setting spray to keep your face nice and hydrated, and to seal your makeup in place. Avoid Retinol, Salicylic Acid, and Glycolic Acid. It’s always advisable to check the ingredient list of products before buying them and being aware of what you’re actually putting on your skin. These acids can irritate your skin further as they’re very drying. It’s also best if you steer clear of preservative-filled cosmetics and those with added fragrance. Opt for natural and hydrating ingredients like Shea Butter, Glycerin, and Lanolin. These ingredients help moisturize and nourish your skin to help repair it from its core. Hyaluronic Acid works wonders in adding moisture and getting rid of dry, flaky skin. Niacinamide or Vitamin B3 helps in strengthening your skin’s barrier. Melasma is another common issue that women face more often than men. It causes brown to grey-brown patches on the face or other parts of the body. Most women get it on their cheeks, forehead, chin, the bridge of the nose, and above the upper lip. You may wonder what seems to trigger melasma? The answer is hormonal changes (more so during pregnancy) and sun exposure. Also, if a product irritates your skin, melasma can worsen. It’s important to visit the dermatologist to help treat this condition because they’ll know exactly what your skin requires to help treat it. 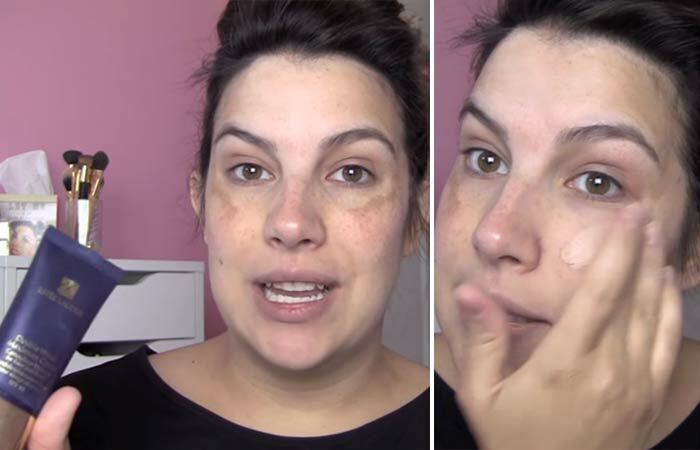 Meanwhile, here are a few ways in which you can use makeup to hide melasma. Always, always use an SPF when you intend to step out as melasma can worsen with sun exposure. It will not only prevent further damage but will help protect the affected areas from harmful exposure to the sun. Opt for a primer that works best for your skin type. 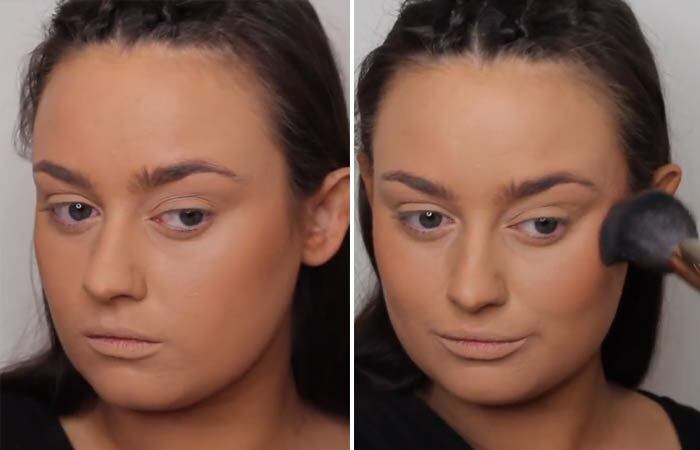 Now if you’re looking to go all the way in, using a high coverage foundation is a good idea. However, if you aren’t comfortable, you can still use a light to medium coverage foundation and combine it with spot concealing. Use a luminizing concealer to brighten and balance out the affected areas. This is optional but if you like a little setting powder over your T-zone, use one that suits your skin type. A powder or cream blush to add color. Follow these simple steps to help you cover your melasma and achieve a flawless base. Wash your face, apply your regular moisturizing lotion and use a primer. Prepping is the most crucial part of any makeup routine. 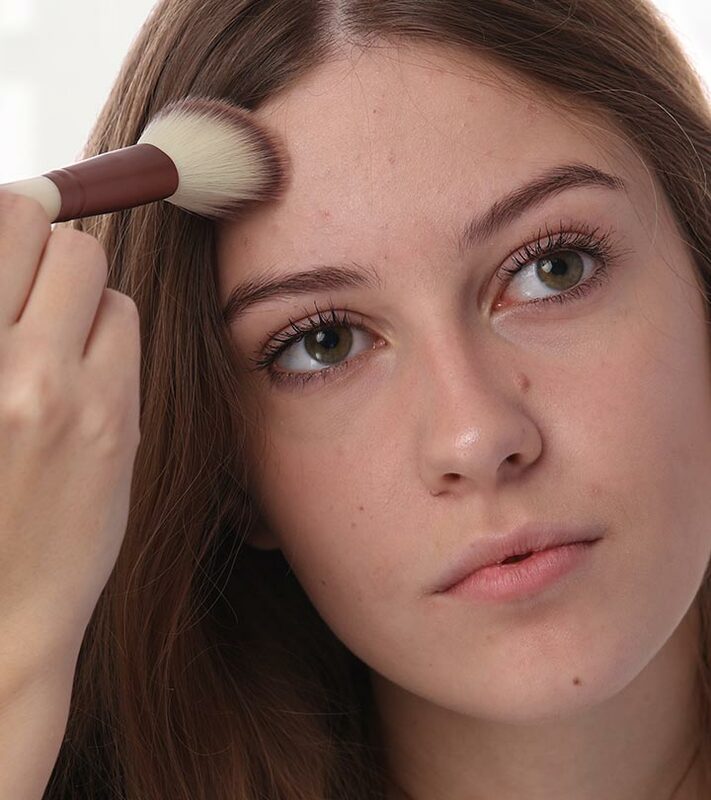 Use a foundation that blends easily and spread it out using your fingers, a stippling brush or a beauty sponge. 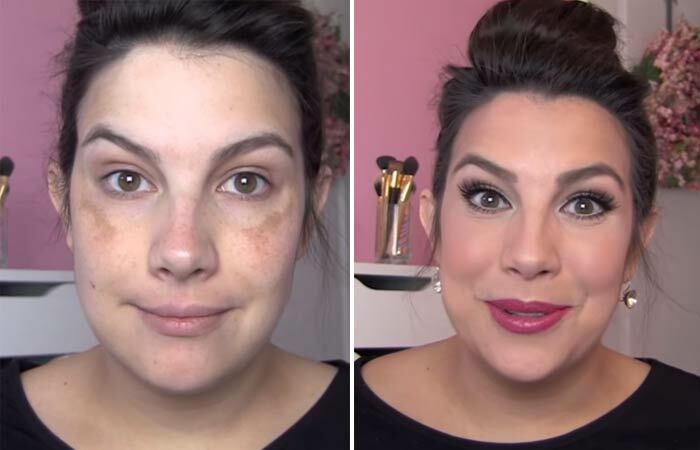 Use a bit of extra foundation on the areas affected with melasma and make sure you don’t fully blend it out; instead, only stipple the area with your brush to effectively cover them up. Use a brightening type concealer for your under eye area and to brighten other pigmented areas. Blend it out using a brush or a sponge. Most high coverage foundations don’t need a powder over them. However, if you have a combination type skin or an oily T-zone, use a setting powder to set these areas. You can also add a hint of blush for some color on your face as foundations often tend to wash out your skin tone. By camouflaging and concealing, you can achieve a flawless base and cover the brown blotches brought on by melasma with ease. That was all about using makeup and a few simple tricks to achieve beautiful skin despite all the issues that you’re facing. We all have one or more skin issues we’d like to conceal, and there’s no need to feel ashamed of them. Take your time and have a talk with your dermatologist about what you can do to permanently resolve your problems. Until then, you always have makeup to rely on if you can’t step out without a few touch-ups. I hope this article helped you and if you have any questions, feel free to leave your comments or queries in the comments section below.